According to the Sagas of Icelanders, Norsemen from Iceland first settled Greenland in the 980s. There is no special reason to doubt the authority of the information that the sagas supply regarding the very beginning of the settlement, but they cannot be treated as primary evidence for the history of Norse Greenland because they embody the literary preoccupations of writers and audiences in medieval Iceland that are not always reliable. Erik the Red (Old Norse: Eiríkr rauði), having been banished from Iceland for manslaughter, is said to have explored the uninhabited southwestern coast of Greenland during the three years of his banishment. He made plans to entice settlers to the area, even purposefully choosing the name Greenland to attract potential colonists, saying "that people would be more eager to go there because the land had a good name". The inner reaches of one long fjord, named Eiriksfjord after him, was where he eventually established his estate Brattahlid. He issued tracts of land to his followers. At its peak, the colony consisted of two settlements, the Eastern and the Western Settlement, with a population of 3,000-5,000; at least 400 farms have been identified by archaeologists. Norse Greenland had a bishopric (at Garðar) and exported walrus ivory, furs, rope, sheep, whale or seal blubber, live animals such as polar bears, and cattle hides. In 1261, the population accepted the overlordship of the Norwegian King although it continued to have its own law. In 1380, the Norwegian Kingdom entered into a personal union with the Kingdom of Denmark. The colony began to decline in the 14th century. The Western Settlement was abandoned around 1350, and by 1378 there was no longer a bishop at Garðar. After a marriage was recorded in 1408, no written records mention the settlers. It is probable that the Eastern Settlement was defunct by the late 15th century. The most recent radiocarbon date found in Norse settlements as of 2002 was 1430 A.D. (+/- 15 years). Several theories have been advanced to explain the decline. The Little Ice Age of this period would have made travel between Greenland and Europe more difficult, and it would have made farming more difficult; in addition, Greenlandic ivory may have been supplanted in European markets by cheaper ivory from Africa. Despite the loss of contact with the Greenlanders, the Norwegian-Danish crown continued to consider Greenland a possession. 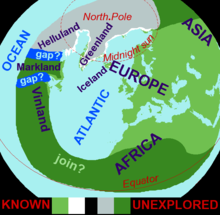 Not knowing whether the old Norse civilization remained in Greenland or not—and worried that if it did, it would still be Catholic 200 years after the Scandinavian homelands had experienced the Reformation—a joint merchant-clerical expedition led by the Norwegian missionary Hans Egede was sent to Greenland in 1721. Though this expedition found no surviving Europeans, it marked the beginning of Denmark's assertion of sovereignty over the island.